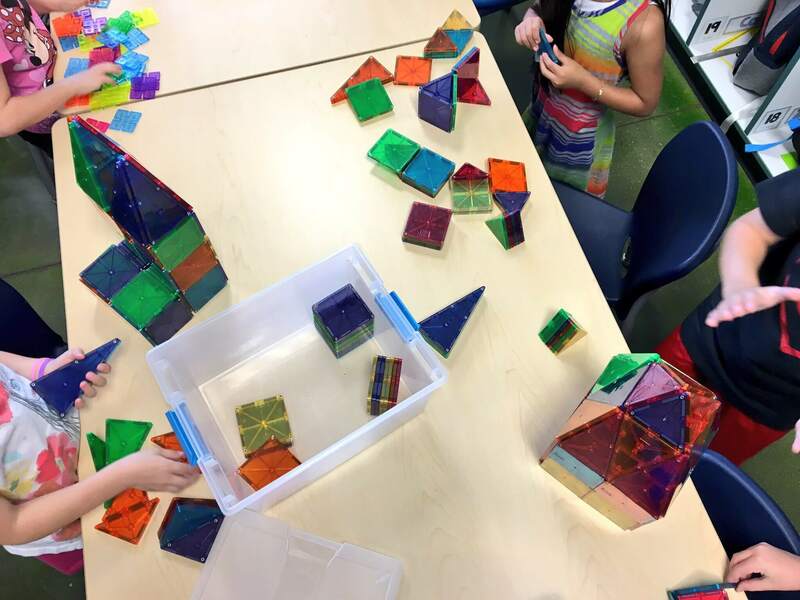 Morning Tubs offer a play-based opportunity for students to explore, create, and communicate. 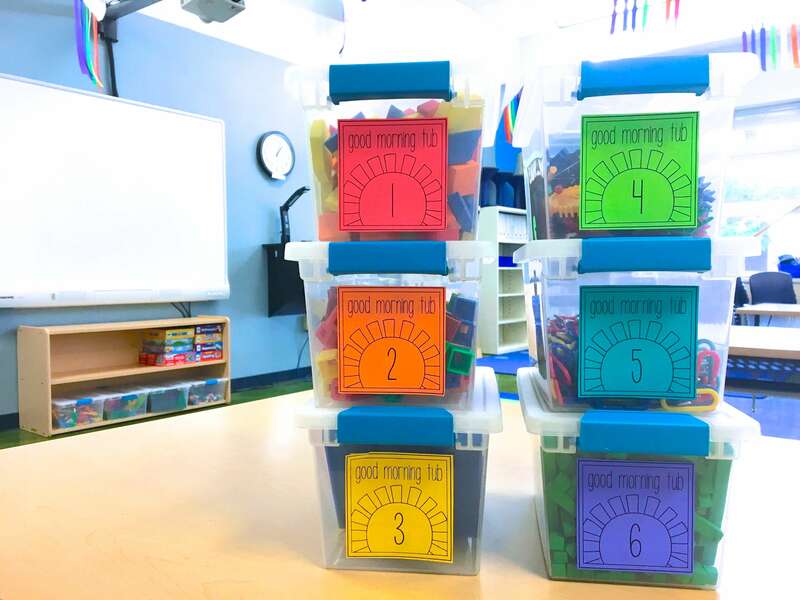 A non-threatening way to start the day, Morning Tubs help reduce the length of your morning routine, get students excited about the day, and encourage collaboration. You can read all about how Morning Tubs work in my classroom and ideas for launching them with your students HERE! Throughout the post, you’ll find Amazon Affiliate links, which means Amazon tosses a few nickels my way if you purchase something through that link, at no extra cost to you, that help keep my corner of cyber-space running and helps fund giveaways! Letter Cubes – From student names to environmental words to weekly phonics patters, these letter cubes are perfect for building words or towers! 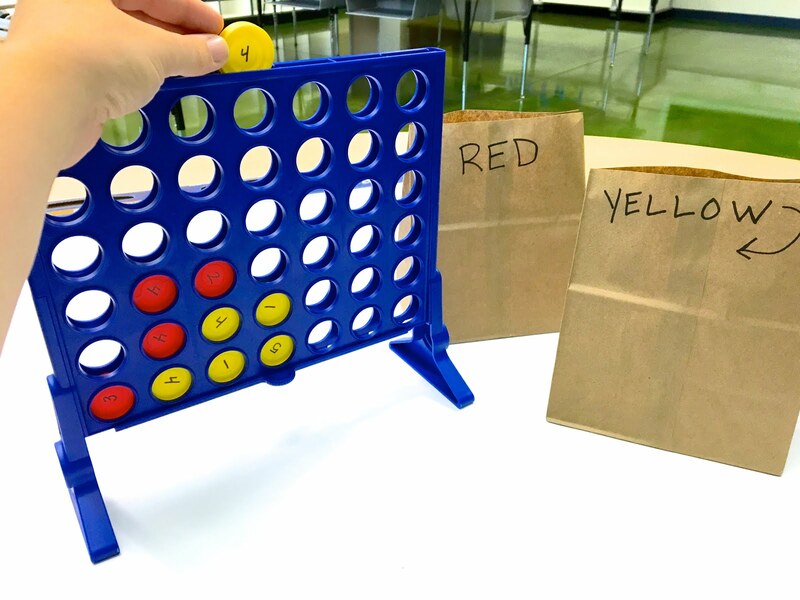 Phonics Dice – Add phonics dice with a whiteboard and students can simply and easily sort real and nonsense words! Letter Tiles – Play like scrabble or just see who can make the longest word! 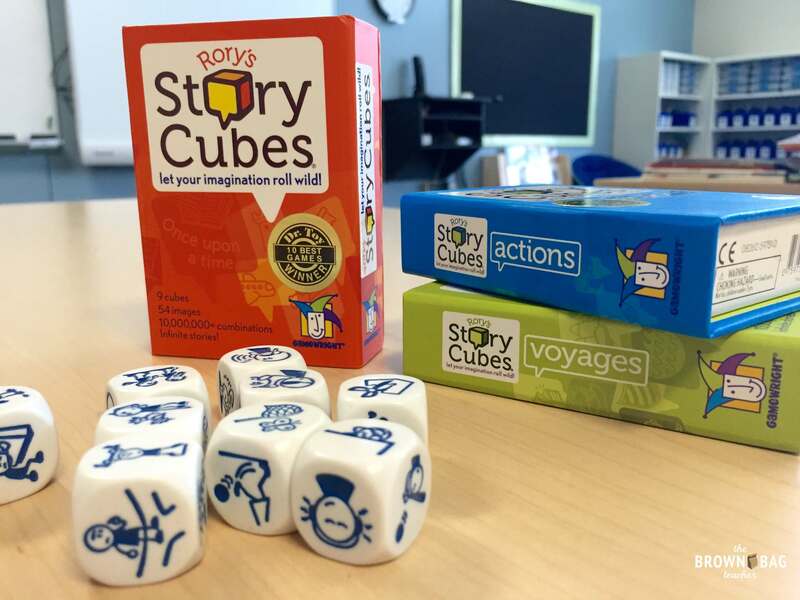 Story Telling Cubes – My 1st graders also LOVE Story Cubes. Each set of cubes has a different theme (verbs, ways to move, places to visit). Students role 2-3 of the dice and combine them into a story. These dice are perfect for adding excitement and novelty to writing! Letter Beads & Pipe Cleaners – Perfect for building fine motor skills, students can build sight words, weekly spelling words, or names of their friends! 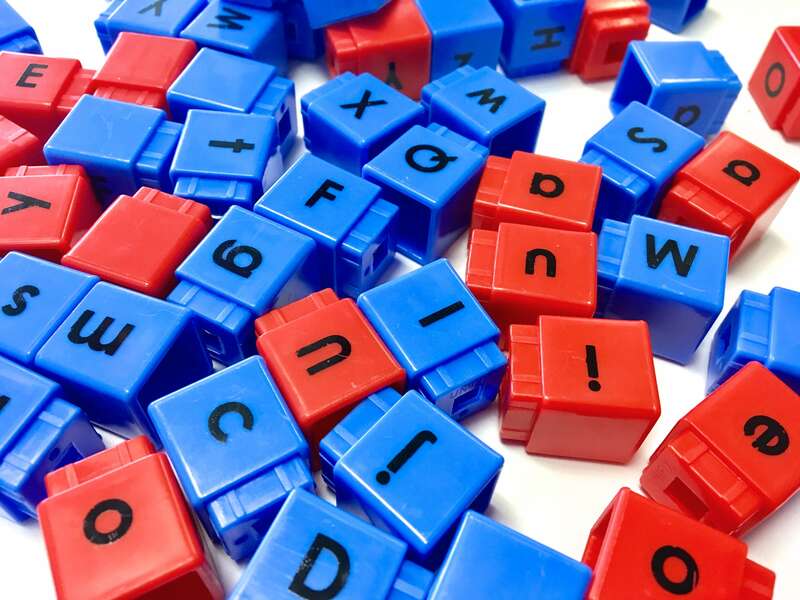 Phonics Dominoes – Perfect for Morning Tubs or a Guided Reading warm-up, there are lots of different types of tiles – blends, long vowels, digraphs! BrainQuest Cards– Pull out your old knowledge fans from the attic and put them to use! Chick-fila often includes these in Kids Meals, so keep your eyes open! Bananagrams for Beginners – This set of Bananagrams is made for little friends and has digraphs and blends already attached. So th, ee, bl, etc. are already attached, so students don’t have to find the individual letters! Please note, this is HARD. It takes lots of practice with small groups of friends. It is a blast, but definitely takes practice…so be warned! Scented Markers & Letter Writing Paper – Who doesn’t love the chance to write with scented markers? From teacher love notes to staff appreciation notes, give students the chance to write freely and for their own purpose. Dominoes – Whether sorting by sum or difference or creating an intricate pattern, dominoes are always a winner. And foam dominoes??? A teacher’s dream! Connecting Links – These links are perfect for showing numbers in different ways or creating jump ropes. To each his or her own! 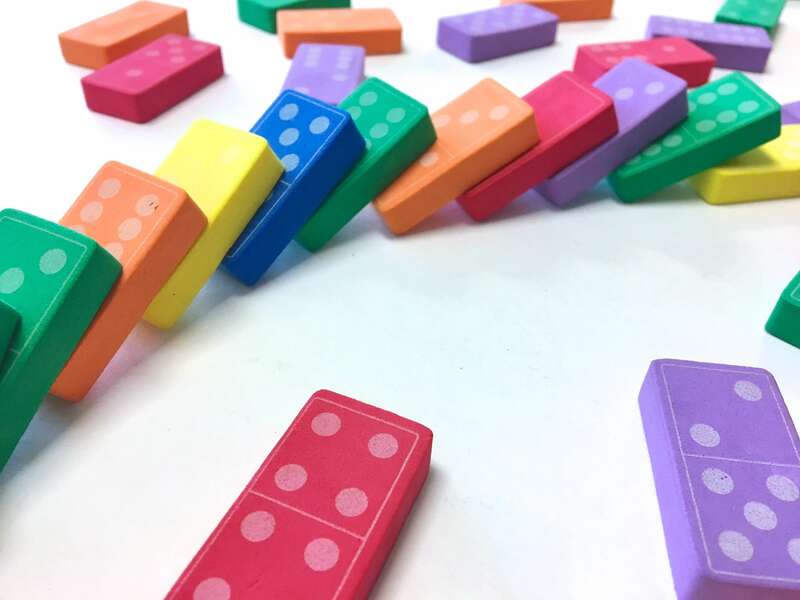 Cuisenaire Rods – These are my go-to resource for teaching part-part-whole and students love the chance to create with them. 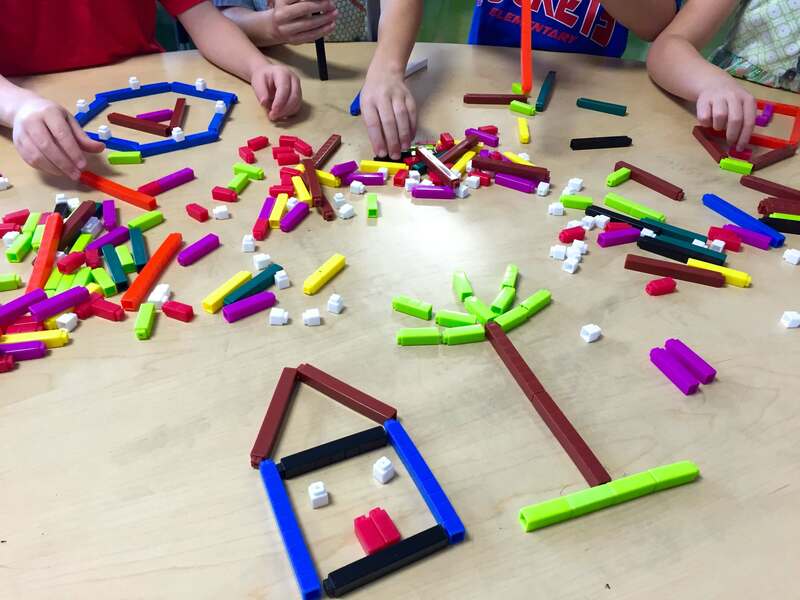 From houses to palm trees, these sometimes math tools make great building blocks! Want to add a challenge? Make a creation and then, figure out the sum of all the rods used. Plastic Coins & a Cash Register – Let students collect small items from around the room and open a store at their Team Table. This is the perfect time to introduce coins and money, especially since they aren’t officially introduced until 2nd grade! Dice & Dry Erase Markers – I like dice and I cannot lie. They are a perfect tool for adding, subtracting, and leveling your instruction! 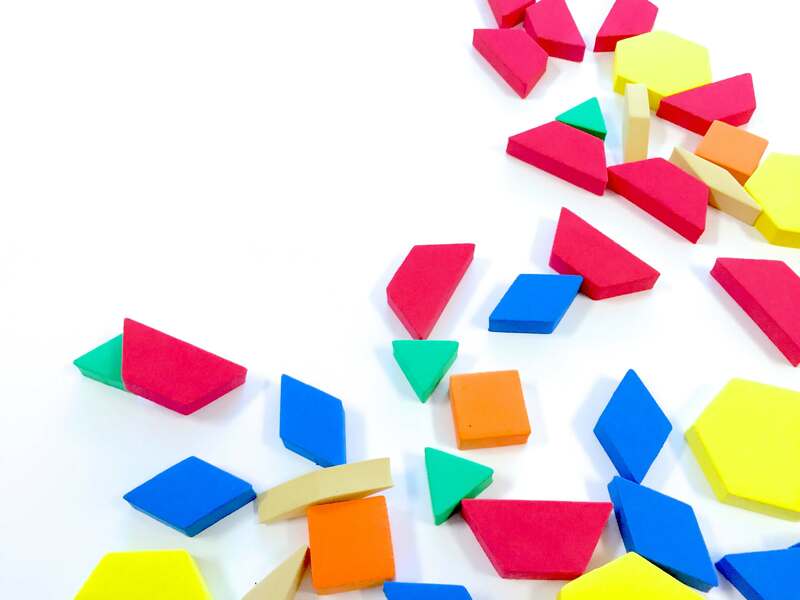 Foam Shapes – From sorting to organizing to building, foam shapes are a versatile math/creation tool! Origami Squares & Directions – There are tons of free online tutorials that can be easily printed and slipped into a tub. Plus, during the winner, paper snowflakes make a perfect classroom decoration and in the spring, who doesn’t love making a paper airplane?! Playdoh and straws – Use 1 inch straw pieces to act as building blocks or to help form letters! Rubbings – From coins to leaves to texture blocks, rubbings are a think of the past. Last fall when I introduced my friends to leaf rubbings, they responded “Oh I’ve done this on the iPad.” No. No you haven’t. Whiteboards & Markers – What kid doesn’t dream of being able to use the whiteboard however they wish?!? 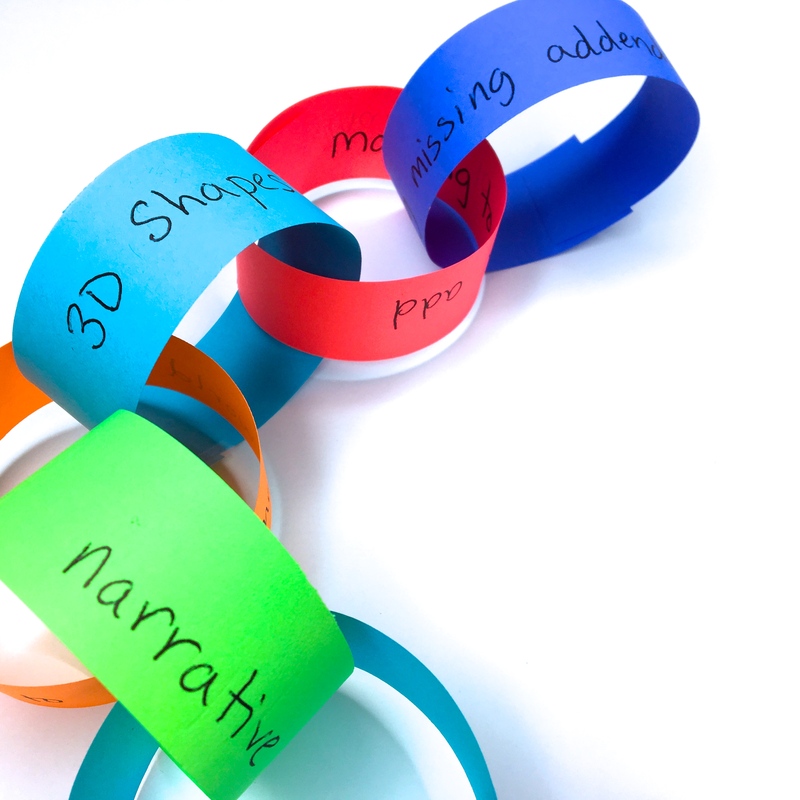 Strips of Colored Paper (paper chains) – Let students write what they are learning right now, words that follow a phonics pattern, or reasons they love school. Regardless, it’s a perfect chance to sneak in some writing and brighten up your classroom! Stamps & Scrap Paper – From letter stamps to design, students can create their own scenes that will be perfect to write about during Work on Writing! Nature Bin – Add magnifying glassed with shells, rocks, leaves, pinecones, and other outdoorsy things and let your students explore, make observations, and record their findings. 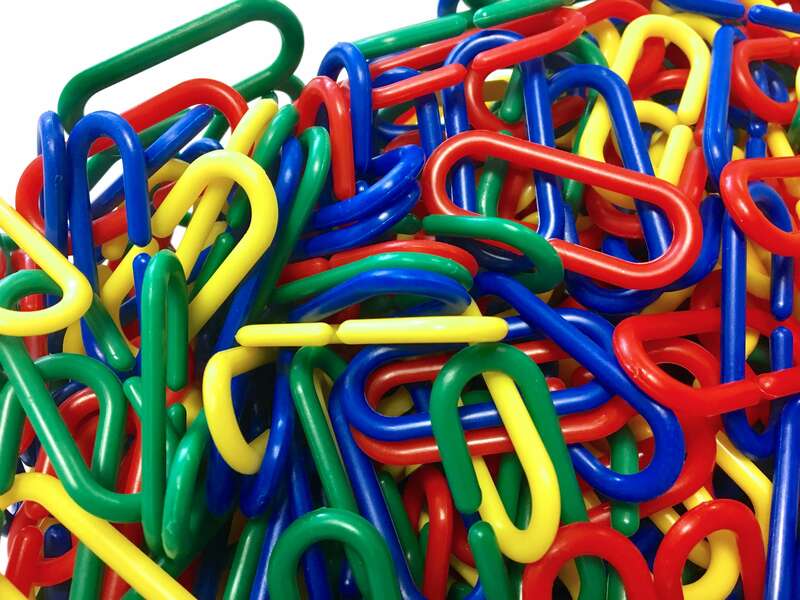 Magnets & Paperclips – Science-based tubs are always a winner. We love magnets and the “magic-ness” of them. Popsicle Sticks & Marbles – A bag of marbles from Dollar Tree and a box of popsicle sticks make the perfect materials for a maze. Students have to create a pathway using the sticks and then, ‘run’ their marble through their creation! Target Mini-Erasers – Students can sort, create patterns, and build with this Dollar Spot winners! 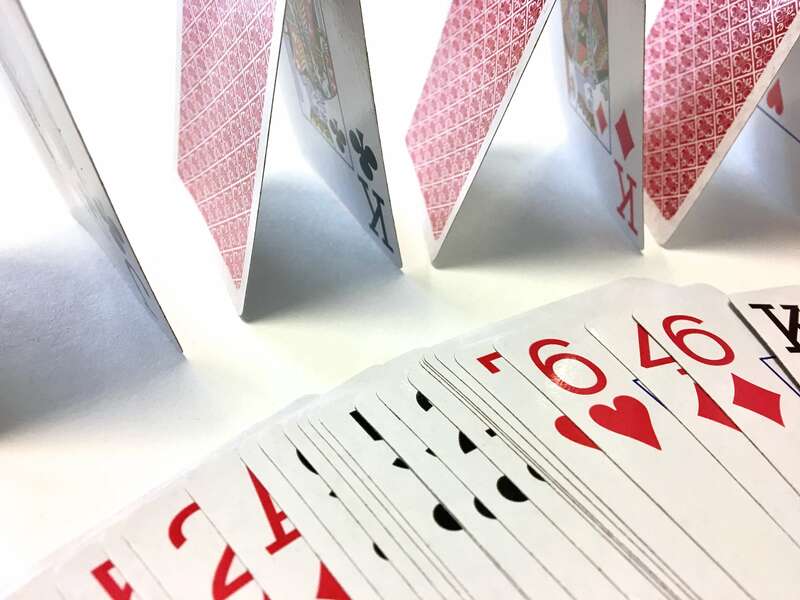 Playing Cards – Perfect for Go-Fish, War, or just building, cards are a simple and timeless morning tub. 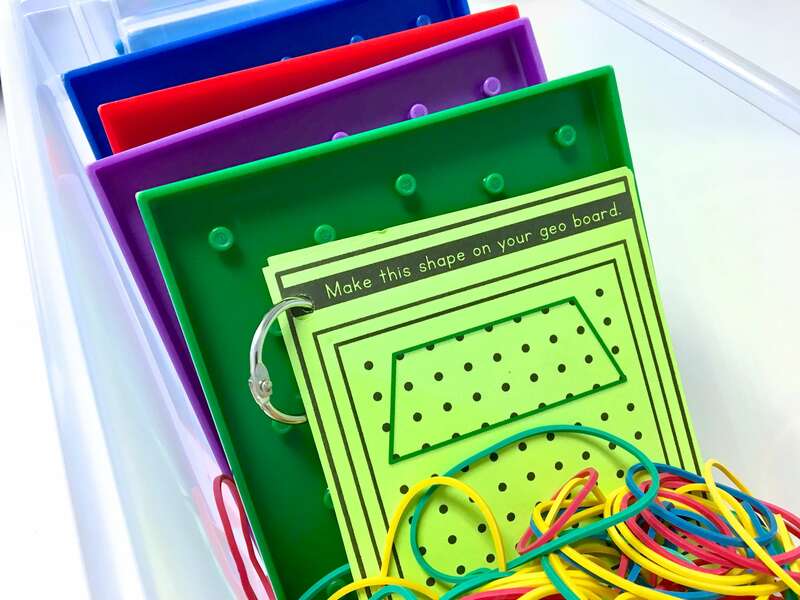 Geoboards – Rubber bands are a perfect way to strengthen little fingers. Plus, geoboards are a blast! From designing letters to making shapes with task cards, their are endless possibilities! Yarn & Scissors – Although it’s a messy tub, students love cutting yarn to create names, sight words, or even depict our weekly vocabulary words. Take a picture, upload it to SeeSaw, and BOOM! 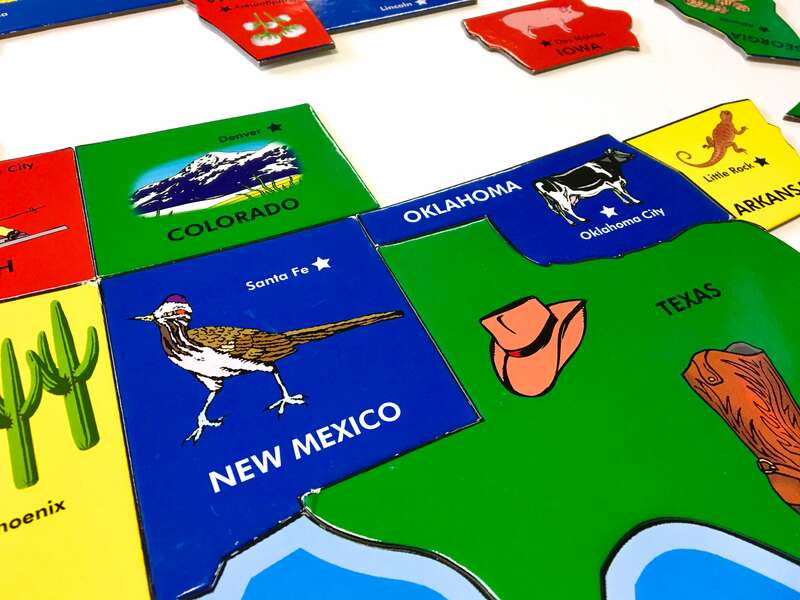 Puzzles – From the USA to a World Map, puzzles are a fun way to explore maps, diagrams, and animals! 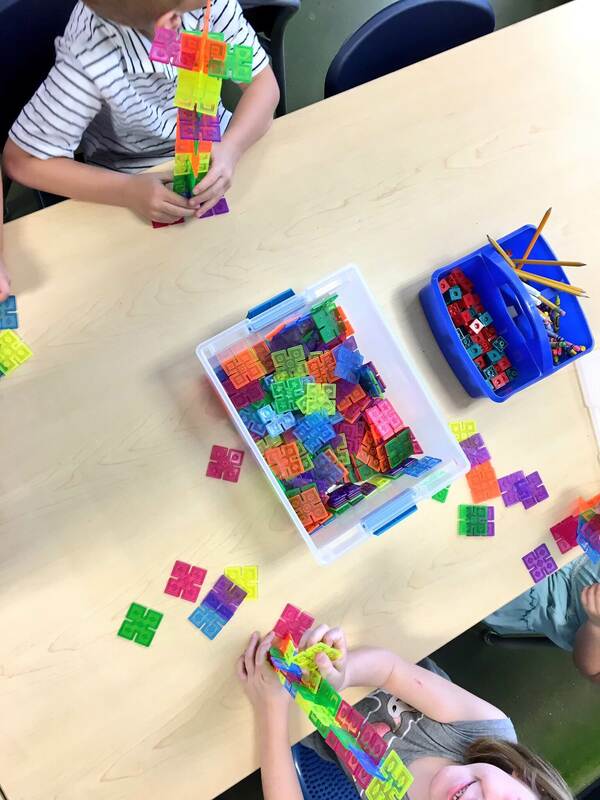 Making 10/20 Connect 4 – Wether it’s a math center or a morning tub, we love this game! Read more about how we play Connect 4 and FREE visual directions here. Making 10/20 Go Fish – Card games are always a win. We build number fluency while practice important social skills – asking others for something, including others, losing/winning gracefully. Tinker Toys: We have A LOT of building resources in our tubs. While this can quickly branch into “indoor recess” type of material, students still don’t have full recess range of freedoms. Additionally, when students build, create, and collaborate they are active, talking, and building relationships. 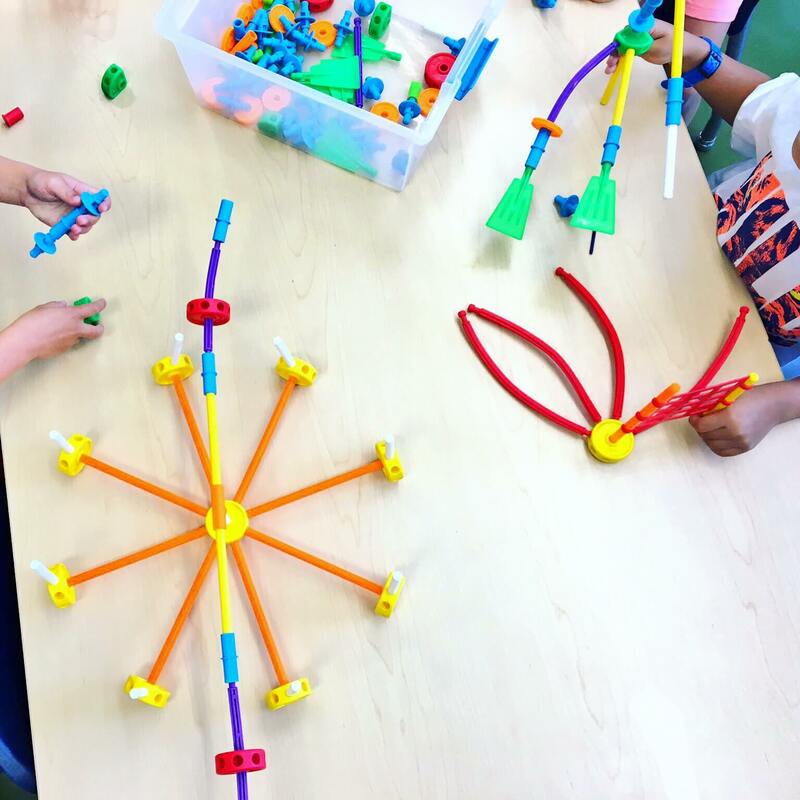 We love Tinker Toys because we can create spinning and moving machines! Interlox are also a class favorite. At first my friends struggled with them because their natural reaction is to build up. 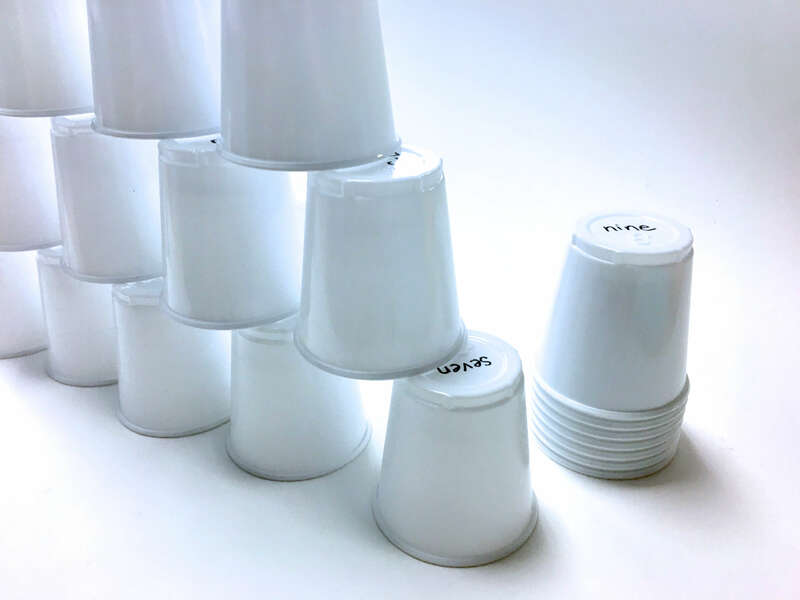 Students quickly learn that if they only build up, their towers will topple. By building wide and creating a strong base, students learn that they can create intricate buildings with these tools! So Who is Footing the Bill? This is the awesome thing about Morning Tubs, most of the materials are things you already have laying around your classroom. You only need to buy things if you want to, otherwise reuse what you have!! 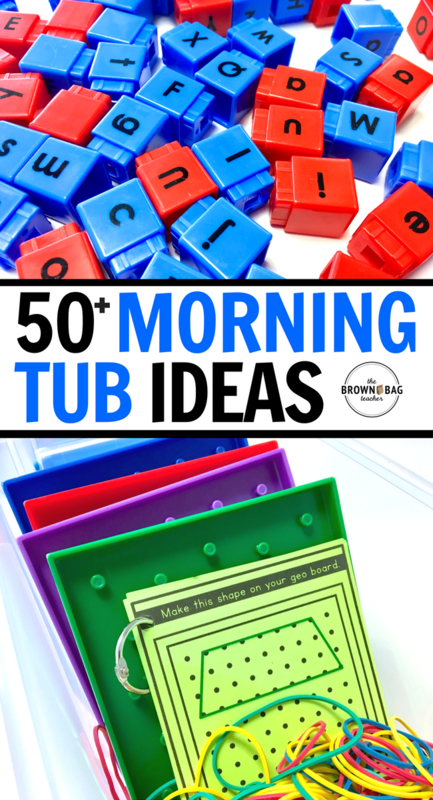 If you are looking to gather other Morning Tub materials affordably, consider some of my go-to sources! Donors Choose – Donors Choose is a crowd-funding hub that allows public-schools to request classroom materials, and for people across the world to fulfill those requests. Donors Choose helps connect the public to schools and helps lessen teacher spending by providing materials that students need to learn- making connections, and helping to fill the gap in unfunded school programs. Read more about how to get started on Donors Choose and ideas for projects in THIS blog post. Using your Scholastic Bonus Points to shop the Teacher Catalog – Read HERE how I maximize my Scholastic Order to snag more bonus points for my classroom! So friends, are you ready to take the Morning Tub jump? If you are already using Morning Tubs, I’d love your help. What are your go-to materials for your Morning Tubs? Hey Maraye! !They are THE best bins. 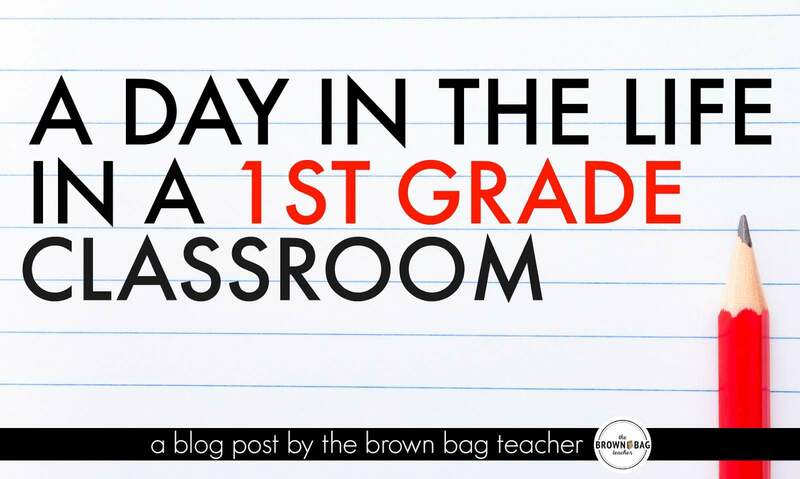 I’ve linked all my favorites in this post: http://brownbagteacher.com/classroom-storage-container/ You can snag the labels for free here: https://www.teacherspayteachers.com/FreeDownload/Morning-Tub-Labels-A-Morning-Work-Alternative-3200958. I saw your original post last summer and added morning tubs to my morning routine this school year. My first graders loved them! My bins contained Legos, Kinex, shapes, Popsicle sticks with Velcro, dominoes, Lincoln logs, and simple wooden blocks. The students loved creating things every day. I had plans to rotate other materials into the bins during the year, but my students didn’t want the materials to change. Thanks for the additional ideas . How often do you change the tubs? Typically every week I change out 2-3 of the tubs. The materials normally make an appearance 2-3 times a year! Thank you for posting all these ideas. I have been putting my tubs out a week at a time but I only did two weeks because I ran out of ideas. I am going to create more now and put them out 2 weeks at a time.great resource!